This review was originally published to the now-defunct website The People’s Reviews in September 2000. Straight on the heels of 2001: A Space Odyssey, Stanley Kubrick has released a film that goes completely the other way in the manner of a glimpse into the future. 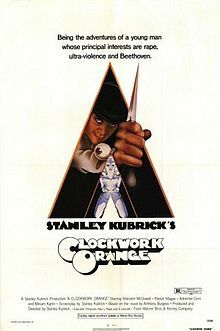 Where 2001 showed the future to be serene and peaceful (albeit complex and dark in the incident portrayed), A Clockwork Orange shows a future where the youth are interested only in the Ultra-Violent. A homeless man says it all, when he speaks of the conquest of other planets in space and how men don’t care about the state of lawlessness the Earth has lapsed into. The central character is Alexander Delarge, or Alex, who is the leader of a band of hoodlums who spend their nights terrorizing the local population, destroying property, stealing cars, and clashing with other bands of hoodlums. The members of his gang, however, find his methods tiresome and desire larger returns for their work. He squashes this brief mutiny only to be betrayed by the mutineers, and finds himself serving time in prison for murdering a woman. At the prison, he learns of a medical procedure that is being tested that is supposed to get prisoners out of jail quicker. He volunteers for the process, which is a conditioned-response training that makes him ill when he views acts of violence. After two weeks he is released back into the world of violence from which he can no longer defend himself, and ends up more pathetic than the least of his victims. While A Clockwork Orange is a social commentary on the perils of mind control, it is also a tale of violence in a world gone very wrong. Kubrick’s powerful imagery and shocking use of color, coupled with Malcolm McDowell’s tremendous no-holds-barred portrayal of the most ultra-violent Alex, team up to make this one of the most high-impact films of all time. Even by today’s standards, this is an extremely nasty and violent film which leaves a lasting image in the viewer’s brain. It’s almost frightening to think of the mind that could dream up such violence, let alone visualize it for the big screen. The video in the Kubrick Collection is released in its original aspect ratio of 1.66:1, which means that you get a letterbox effect but one that is not as severe as with 70mm Panavision (1.87:1 aspect ratio). Even if you do not like widescreen editions, it’s very unobtrusive, and still shows the panorama of the widescreen cinema shot. What you lose is a thin line at the top and bottom of the screen, and what you gain is the breathtaking art in Kubrick’s talented eye. You also lose the pan-and-scan video view, which can be very annoying even to those who dislike the widescreen video format. Regardless, those who haven’t seen A Clockwork Orange would do very well to see it. Fans of Kubrick, as well as fans of Tarantino and Rodriguez, will love this film. I place it in my all-time top ten list of films. Full of iconic imagery. In my top 3 Kubrick along with Paths of Glory and Full Metal Jacket.